John Prine (born October 10, 1946) is an American country/folk singer-songwriter. He has been active as a composer, recording artist, and live performer since the early 1970s. Born and raised in Maywood, Illinois, Prine learned to play the guitar at the age of 14. Subsequently, serving in West Germany with the U.S. armed forces, by the late 1960s he had moved to Chicago, where he worked as a mailman, writing and singing songs as a hobby. Becoming a part of the city's folk revival, he was discovered by Kris Kristofferson, resulting in the production of Prine's self-titled debut album through Atlantic Records in 1971. After receiving critical acclaim, Prine focused on his musical career, recording three more albums for Atlantic. He then signed to Asylum Records, where he recorded an additional three albums. After his battle with squamous cell cancer in 1998, Prine's vocals deepened into a gravel-voice, resulting in the award-winning album Fair & Square (2005). Prine is the son of William Prine and Verna Hamm. He started playing guitar at age 14, taught by his brother, David. Prine attended Proviso East High School in Maywood, Illinois. He was a mailman for five years and served in the Army during the Vietnam War era, serving in Germany, before beginning his musical career in Chicago. In the late 1960s, while Prine was delivering mail, he began to sing at open mic evenings at the Fifth Peg on Armitage Avenue in Chicago. Prine was initially a spectator, reluctant to perform, but eventually did so in response to a "You think you can do better?" comment made to him by another performer. Chicago Sun-Times movie critic Roger Ebert heard him there and wrote the first review Prine ever received, calling him a great songwriter. He became a central figure in the Chicago folk revival, which also included such singer-songwriters as Steve Goodman, Bonnie Koloc, Jim Post and Fred Holstein. Joined by such established musicians as Jethro Burns and Bob Gibson, Prine performed frequently at a variety of clubs—including the Earl of Old Town, the Quiet Knight, Somebody Else's Troubles, The 5th Peg, and the Bulls. Prine currently resides in Nashville with his third wife, Fiona Whelan. They have three children, stepson Jody Whelan, Tommy and Jack. Prine also has a residence in Gulfport, Florida, and Galway, Ireland. In 1971 Prine's self-titled debut album was released. He and friend Steve Goodman had each been active in the Chicago folk scene before being "discovered" by Kris Kristofferson (Kristofferson remarked that Prine wrote songs so good that "we'll have to break his thumbs"). The album included his signature songs "Illegal Smile," "Sam Stone," and the folk and country standards "Angel from Montgomery" and "Paradise." The album also featured "Hello In There," a song about aging that was later covered by numerous artists, and "Far From Me", a lonely waltz about lost love for a waitress that Prine later said was his favorite of all his songs. The album received many positive reviews, and some hailed Prine as "the next Dylan." Bob Dylan himself appeared unannounced at one of Prine's first New York City club appearances, anonymously backing him on harmonica. Prine's second album, Diamonds In The Rough, was a surprise for many after the critical success of his first LP; it was an uncommercial, stripped-down affair that reflected Prine's fondness for bluegrass music and features songs reminiscent of Hank Williams. Highlights include the allegorical "The Great Compromise," which features a recitation and addresses the Vietnam War, and the ballad "Souvenirs," which Prine later recorded with Goodman. Subsequent albums include Sweet Revenge (1973), containing such fan favorites as "Dear Abby," "Grandpa Was A Carpenter," and "Christmas In Prison," and Common Sense (1975), with "Come Back to Us Barbara Lewis Hare Krishna Beauregard". The latter album was Prine's first to be charted in the US Top 100 by Billboard, reflecting growing commercial success. It was produced by Steve Cropper. Many veteran Prine fans view the release of 1978's Bruised Orange as a creative highpoint. The Steve Goodman-produced album gave listeners songs such as "The Hobo Song," "Sabu Visits the Twin Cities Alone," and the title track. In 1974, singer David Allan Coe achieved considerable success on the country charts with "You Never Even Called Me By My Name", co-written by Prine and Goodman. The song good-naturedly spoofs stereotypical country music lyrics. Prine refused to take a songwriter's credit and the tune went to Goodman, although Goodman bought Prine a jukebox as a gift from his publishing royalties. In 1975, Prine toured the U.S. and Canada with a full band featuring guitarist Arlen Roth. As of 2014, this has been Prine's only tour with a full band. The 1979 album Pink Cadillac features two songs produced by Sun Records founder Sam Phillips, who by this time rarely did any studio work. The first song, "Saigon," is about a Vietnam vet traumatized by the war ("The static in my attic's gettin' ready to blow"). During the recording, one of the guitar amps blew up (which is evident on the album track). The other song Phillips produced is "How Lucky," about Prine's hometown. Prine continued writing and recording albums throughout the 1980s and formed his own record label, Oh Boy Records. His songs continued to be covered by other artists; the country supergroup The Highwaymen recorded "The Twentieth Century Is Almost Over," which had been written by Prine and Goodman. Steve Goodman died of leukemia in 1984 and Prine continues to perform many of Goodman's songs in concert to this day, such as "My Old Man." In 1991, Prine released the Grammy Award-winning The Missing Years, his first collaboration with producer and Heartbreakers bassist Howie Epstein. The title song records Prine's humorous take on what Jesus did in the unrecorded years between his childhood and ministry. In 1995, Lost Dogs and Mixed Blessings was released, another collaboration with Epstein. Prine followed in 1999 with In Spite of Ourselves, which was unusual for him in that it contained only one original song; the rest were covers of classic country songs. And all of the tracks are duets with well-known female country vocalists, including Lucinda Williams, Emmylou Harris, Dolores Keane, and Iris DeMent. In 2001 Prine co-starred in the Billy Bob Thornton movie Daddy & Them. "In Spite of Ourselves" can be heard as the end credits roll. Prine recorded a version of Stephen Foster's "My Old Kentucky Home" in 2004 for the compilation album Beautiful Dreamer, which won the Grammy for Best Traditional Folk Album in 2004. In 2005, Prine released his first all-new offering since Lost Dogs and Mixed Blessings, the album Fair & Square, which tended toward a more laid-back, acoustic approach. The album contains songs such as "Safety Joe," about a man who has never taken any risks in his life, and also "Some Humans Ain't Human," Prine's protest piece on the album, which talks about the ugly side of human nature and includes a quick shot at President George W. Bush. Fair & Square won the 2005 Grammy Award for Best Contemporary Folk Album. The album contains original songs plus two covers: A.P. Carter's "Bear Creek Blues" and Blaze Foley's "Clay Pigeons." 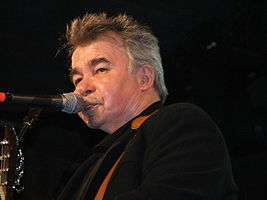 On June 22, 2010, Oh Boy Records released a tribute album titled Broken Hearts and Dirty Windows: The Songs of John Prine. The album features members of the modern folk revival including My Morning Jacket, The Avett Brothers, Conor Oberst and the Mystic Valley Band, Old Crow Medicine Show, Lambchop, Josh Ritter, Drive-By Truckers, Nickel Creek's Sara Watkins, Deer Tick featuring Liz Isenberg, Justin Townes Earle, Those Darlins, and Bon Iver's Justin Vernon. In early 1998, Prine was diagnosed with squamous cell cancer on the right side of his neck. He had major surgery to remove a substantial amount of diseased tissue, followed by six weeks of radiation therapy. The surgery altered his vocals, and has added a gravelly tone to his voice. On November 21, 2013, a note on Prine's website said that he will undergo surgery for lung cancer, forcing the postponement of two dates in Louisville, Kentucky. Prine said doctors found the cancer early and "see no reason why I won't fully recover." The cancer is not related to the squamous cell cancer. In 2003, Prine was given a Lifetime Achievement Award for songwriting by the UK's BBC Radio 2 and that same year was inducted into the Nashville Songwriters Hall of Fame. The following year saw his song "Sam Stone" covered by Laura Cantrell for the Future Soundtrack for America compilation. On March 9, 2005, at the request of Poet Laureate Ted Kooser, John Prine became the first singer/songwriter to read and perform at the Library of Congress. In 2016, Prine was named winner of the PEN/Song Lyrics Award, given to two songwriters every other year by the PEN New England chapter. The 2016 award was shared with Tom Waits and his songwriting collaborator wife Kathleen Brennan. Judges for the award included Peter Wolf, Rosanne Cash, Paul Simon, Elvis Costello and others, as well as literary judge Salman Rushdie. Prine is widely regarded as one of the most influential songwriters of his generation. In 2009, Bob Dylan told The Huffington Post that Prine was one of his favorite writers, stating "Prine's stuff is pure Proustian existentialism. Midwestern mindtrips to the nth degree. And he writes beautiful songs. I remember when Kris Kristofferson first brought him on the scene. ‘Sam Stone’ featuring the wonderfully evocative line: ‘There’s a hole in daddy’s arm where all the money goes, and Jesus Christ died for nothing I suppose.’ All that stuff about "Sam Stone," the soldier junkie daddy, and "Donald and Lydia," where people make love from ten miles away. Nobody but Prine could write like that." Johnny Cash, in his autobiography Cash, wrote, "I don't listen to music much at the farm, unless I'm going into songwriting mode and looking for inspiration. Then I'll put on something by the writers I've admired and used for years--Rodney Crowell, John Prine, Guy Clark, and the late Steve Goodman are my Big Four..." Roger Waters, when asked by Word Magazine in 2008 if he heard Pink Floyd's influence in newer British bands like Radiohead, replied, "I don't really listen to Radiohead. I listened to the albums and they just didn't move me in the way, say, John Prine does. His is just extraordinarily eloquent music—and he lives on that plane with Neil Young and Lennon." Prine received the Artist of the Year award at the Americana Music Awards on September 9, 2005. While he's always worked social commentary into his work—he even was tagged a protest singer in his career—the song "Some Humans Ain't Human," containing some anti-Bush lyrics, is a pointed political commentary reminiscent of "Your Flag Decal Won't Get You into Heaven Anymore" from his 1971 debut. "I felt like I had to write something about how I feel about the way things are in this country right now." ↑ "John Prine Information". Shrout.co.uk. 1946-10-10. Retrieved 2011-03-15. ↑ "The Devil's Music: John Prine – S/T – 1971". Devildick.blogspot.de. 2012-02-07. Retrieved 2013-06-15. ↑ "Roger Ebert's Journal: "John Prine: American Legend"". Chicago Sun-Times. Retrieved 23 February 2015. ↑ Chilton, Martin. "John Prine: I Find the Human Condition Funny; John Prine, One of Bob Dylan's Favourite Songwriters, Is Appearing in the UK and Ireland. Here He Talks to Martin Chilton." Daily Telegraph [London, England] February 8, 2013, Web Edition Articles ed. : Print. ↑ "Broken Hearts and Dirty Windows: The Songs of John Prine; Oh Boy Records". brokenheartsanddirtywindows.com. Retrieved 2012-02-18. ↑ "John Prine personal letter to his fans about his cancer". Jpshrine.org. Retrieved 2011-03-15. ↑ Kavner, Lucas (November 17, 2011). "John Prine, Iconic Folk Singer, Takes Everything In Stride". Huffington Post. ↑ "John Prine Has Operable Form of Lung Cancer". ABCNews.com. Associated Press. November 22, 2013. Retrieved November 22, 2013. ↑ Flanagan, Bill (April 15, 2009). "Bob Dylan Exclusive Interview: Reveals His Favorite Songwriters, Thoughts On His Own Cult Figure Status". Huffington Post. Retrieved 2009-07-12. ↑ Cash, Johnny; Carr (2003). Cash. Patrick. HarperCollins. p. 189. ↑ "Word Interview Exclusive: Roger Waters". Word Magazine. April 13, 2008. Retrieved 2009-07-12. ↑ "CMT : Videos : John Prine : Picture Show". Country Music Television. Retrieved September 16, 2016. ↑ "CMT : Videos : John Prine : Ain't Hurtin' Nobody". Country Music Television. Retrieved September 16, 2016. ↑ "CMT : Videos : John Prine, Holly Williams : I'm Telling You (feat. Holly Williams)". Country Music Television. Retrieved September 16, 2016. A Literary Evening with John Prine and Ted Kooser. March 9, 2005. The Poetry and Literature Center at the Library of Congress. "Speed of the Sound of Loneliness"